449 Pelicans and counting. That’s the number of hungry, injured, California Brown Pelicans that have poured into International Bird Rescue’s San Francisco Bay and Los Angeles Centers since the beginning of July. As some of the first rehabilitated fledgling pelicans are released back into the Bay today at Fort Baker, rescuers know the reality is that these young birds face much more than just the challenge of learning how to fish to make it on their own, as human-caused injuries to these iconic birds continue to rise. After a bumper-breeding season, International Bird Rescue has been caring for huge influxes of fledgling Pelicans to its rescue centers in Fairfield and San Pedro this summer. While many are arriving weak, thin, and disoriented, even more distressing are the preventable human-caused injuries with many also coming in tangled in fishing line, pierced with fishing hooks and even drenched with fish oil from fish cleaning stations in harbors along the west coast. Pelicans are opportunistic feeders, and will dive to grab hooked fish as they are being pulled out of the water by fishermen, making them frequent victims of entanglement in fishing line and severe wounds from hooks. The hooks can be swallowed, pierce bills, or cause long tears in their pouches that make it impossible for them to feed. Compounding this, the hungry birds beg scraps from fish cleaners, and while standing under worktables to catch offerings find themselves covered in oily runoff that ruins the natural waterproofing of their feathers, leaving them cold and wet, and ultimately unable to stay buoyant on the water. Even with rehabilitated pelicans now returning to the wild, the non-profit’s aviaries are still packed with another 250, leaving lots of hungry mouths still to feed. Each pelican consumes half its bodyweight in food each day – about 4-5 pounds of fish per bird– and with rehabilitation periods of several weeks to a month or more, the expenses which include medicines and surgeries as well as food, multiply quickly. International Bird Rescue is currently spending about $2,000 a day on fish alone. 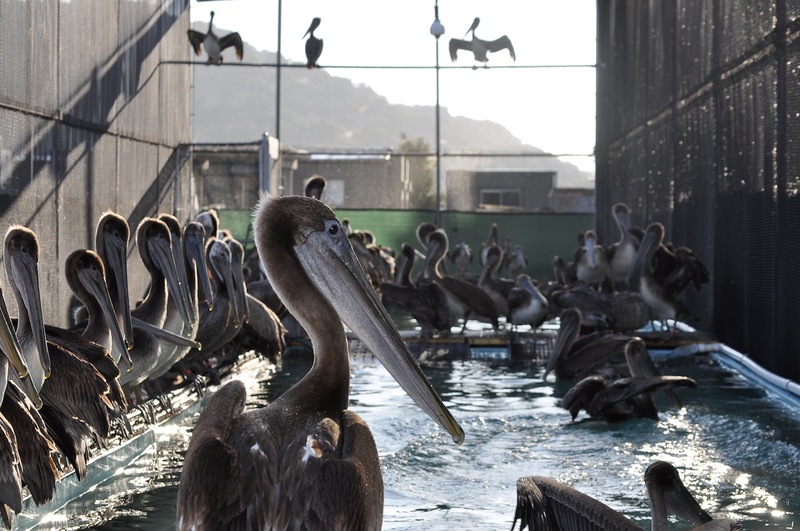 Outside of public support, the nonprofit has no other resources to pay for the care of the Pelicans and is actively seeking support from the public to continue their rescue efforts. Members of the public who are concerned about a Pelican in distress are asked to contact their local Animal Control or WildRescue’s Statewide toll-free hotline number 866-WILD-911. International Bird Rescue is accepting donations to support its ongoing rescue efforts, including a Pelican Partner program through which people are given the unique opportunity to help release a Pelican patient back into the wild. Information on becoming a Pelican Partner, other ways to give, and how to volunteer at International Bird Rescue’s Los Angeles or San Francisco Bay Centers can be found under “Get Involved” at birdrescue.org. California Brown Pelicans will be released at Fort Baker in Sausalito Wednesday, August 1, 2012 at 11:30 a.m.. Please arrive by 11:15 a.m., as birds cannot be held in carriers, and must be released promptly. This entry was posted on Wednesday, August 1st, 2012 at 9:29 am and is filed under Uncategorized. You can follow any responses to this entry through the RSS 2.0 feed. You can skip to the end and leave a response. Pinging is currently not allowed.